Cioppino – an Italian-American fish soup to die for. Cioppino is a fish stew originating in San Fransisco. It is considered an Italian-American dish, and is related to various regional fish soups and stews of Italian cuisine. Cioppino is traditionally made from the catch of the day, which in the dish’s place of origin is typically a combination of Dungerness crabs, clams, shrimp, scallops, squid, mussels and fish. The seafood is then combined with fresh tomatoes in a wine sauce, and served with crusty bread. The dish is comparable to caccissio and brodetto from Italy, as well as other fish dishes from the Mediterranean region such as bouillabaisse, burrida, and bourride of French Provence, and suquet de peix from Catalan speaking regions of coastal Spain. Cioppino was developed in San Francisco in the late 1800s by the famed Italian fish wholesaler Achille Paladini, (later titled “The Fish King”) who settled in the North Beach section of the city, he came from the seaport town of Ancona, Italy in 1865. He originally made it when the boats came back from sea and the ‘left overs’ were used to make a fish stew, a few Dungeness Crabs were also added. It eventually became a staple as Italian restaurants proliferated in San Francisco. The name comes from ciuppin, a word in the Ligurian dialect of the port city of Genoa, meaning “to chop” or “chopped” which described the process of making the stew by chopping up various ‘left overs’ of the day’s catch. 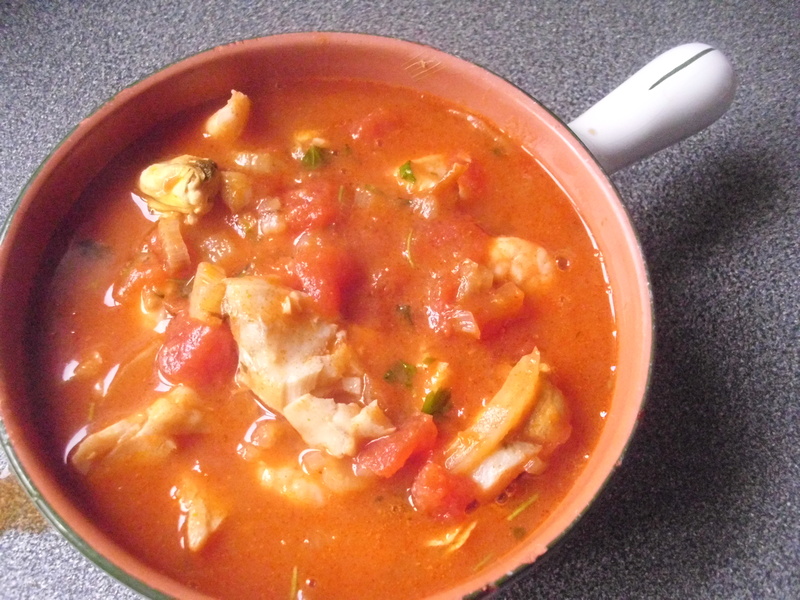 Ciuppin is also a classic soup of Genoa, similar in flavour to cioppino, with less tomato, and the seafood cooked to the point that it falls apart. Generally the seafood is cooked in broth and served in the shell, including the crab (if any) that is often served halved or quartered. It therefore requires special utensils and, importantly, a bib. My version is a lazy version but tastes fantastic and is much easier and quicker to cook. Heat the oil and butter in a large pan until melted then add the shallot, fennel and garlic. Turn the heat to low, cover and cook for about 10 minutes, checking occasionally to ensure it does not burn. Stir in the tomato puree, and white wine and cook for a few minutes to allow the alcohol to evaporate. Then stir in the tomatoes, Tabasco and fish stock. Mix well and simmer gently for 30 minutes. Add the prawns and cod loin and simmer, uncovered, for 5 minutes then add the mussels and allow them to warm through for a minute. Add the parsley, mix carefully, then serve with crusty bread.